We are a leading Manufacturer of sidewall conveyor belts from New Delhi, India. 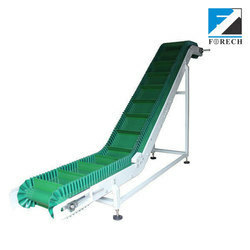 Forech India Limited is a leading manufacturer of Fabric and Steel Cord re-enforced Rubber Conveyor Belts that offers a complete package of products including conveyor accessories, to operate a Conveyor System efficiently and economically. Our management team has over 40 years of experience in delivering quality conveyor products, both in the domestic as well as in the export market globally. With modern manufacturing units in Sonepat, Haryana, and cheyyar (near Kanchipuram), Tamil Nadu; Forech is also uniquely positioned to serve all regions in India with unparalleled proximity to markets. Our manufacturing unit in Cheyyar also produces Steel Cord established with technical know-how from Dunlop Belting Products, South Africa. When designing a conveyor system; ensuring efficiency of carrying bulk materials is critical. In addition, the nature of terrain and space constraints within a particular site can make regular conveyor systems impossible to run.Forest's unique Sidewall Belts allow end users to carry bulk materials at high inclines and angles up to 90 degrees. This allows a material to be carried where space requirements are critical as well as increase overall belt efficiency and throughput. As High Angle belts usually operate in enclosed conditions and deliver hot material, usual temperature ratings applied to flat rubber conveyor belts cannot be applied. Increased temperature exposure over the life of the belt results in accelerated aging and a reduction in belt elasticity which adversely affects the belt life. The effective belt operating temperature, therefore, determines the operating life of the belt. For standard belt constructions, please refer to the chart on right for average belt life at different continuous belt operating temperatures. applications Forech offers sidewall belts with the cleats and the sidewall in heat resistant quality which are fixed on the base belt with hot vulcanization. The operating temperatures listed above for standard quality can be increased by 30ºC if a Heat Resistant belt is used.